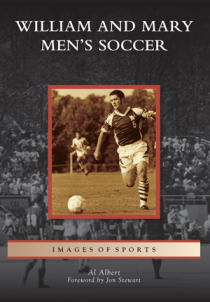 The Barnes & Noble at The College of William & Mary Bookstore will be hosting a local author book signing event on Saturday, March 23rd from 2:00 p.m. – 6:00 p.m. Local author Al Albert will be available to sign copies of William & Mary Men's Soccer. Stop by to get your copy signed! From its humble beginnings as a club team with hand-me-down football jerseys, William and Mary men's soccer team has become an exemplary intercollegiate program. Whether judged by their 30 consecutive winning seasons or the success of their graduates—including Comedy Central's Jon Stewart and MLS stars Wade Barrett, Steve Jolley, and Adin Brown—Tribe soccer has become what college soccer should be. For almost 50 years, William and Mary has not only developed outstanding individuals and teams, but has also exerted an amazing amount of influence on soccer in their community by contributing to the growth of youth, high school, and women's soccer. Author Al Albert was a William and Mary soccer player in the late 1960s and then coached the team for 33 years, from 1971 to 2003. He is now the associate director of athletic development at the College. The original photographs in this book are from William and Mary publications, the William and Mary Sports Information archives, and the author's personal collection. When: Saturday, March 23rd, 2019 at 2:00 p.m.